Over the past few years, lighting has been getting more and more attention from designers and design-lovers alike, and the results have been spectacular. Gone are the days when recessed track lights were the most innovative way to show off the various attractions in a room. Today the lighting is just as likely to be the attraction, as designers present us with new takes on chandeliers and pendants that redefine the role of these pieces in our homes, making them centerpieces rather than accessories. The range of shapes, designs and patterns that are coming from top design studios is inspiring. 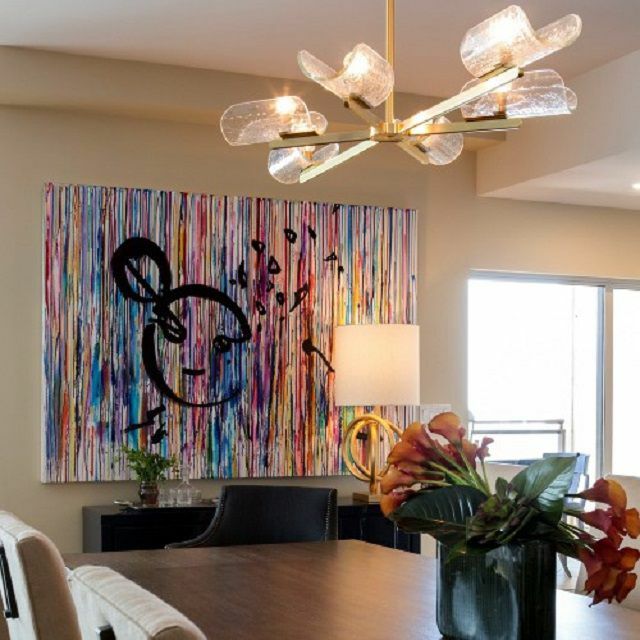 So if you are looking for the perfect accent piece to cap off your favorite room, look no further than these artistic lighting solutions. Founded in 1999 by Marcia Zia and Paul Priven, a husband-and-wife team with a background in the Hollywood entertainment industry, Zia Priven is one of the top companies for dramatic lighting with an artistic flair. Here the Solano II chandelier makes a simple yet elegant statement with its modern, elongated take on the humble light bulb. Using multiple lights to throw illumination in all directions, Zia Priven's Axis Chandelier uses it's unique geometry to turn one light fixture into six. An ultra-modern statement of sleek, minimalist lines punctuated by sharply angled lamp shades on each end, this is an excellent piece to use as the modern accent in a traditional room, or the finishing touch in a more modern space. For anyone who's in the mood for something a bit more eye-catching and conceptual, Zia Priven offers the H20 Rocks Chandelier. A cascade of clear, individually bound nuggets of quartz give this intriguing chandelier it's watery look. A bulb located in the center of the main base diffuses light through the rock, showering it across the room. While pendants, lamps and sconces are all getting the royal treatment from designers, some especially industrious minds have turned their attention to the bulbs that power these lights. The London-based company, Plumen, debuted in 2010 with this artistic twist on energy-efficient light bulbs. A true mix of form and eco-friendly function, Plumen bulbs use a scant 6-11 watts while providing such a unique look that you'll almost hate to cover them with a shade. While it's true that most lamp shades cover the bulb, some bulbs are just too special to hide away. In answer to that conundrum, Plumen offers the Drop Top Lamp Shade. Seen here in amber, the translucent shade's geometric design offers a pleasing counterpoint to the curved shape of the bulb while keeping it on display where it belongs. In 2012, Russell Greenberg and Christopher Beardsley, both architects with separate practices, partnered to create a company around the idea of "building with light." The result is Stickbulb, one of the more interesting in a line of companies offering artisanal lighting solutions with a focus on sustainable design. Originally inspired by spare wood around the office, the company combines reclaimed wood with sustainable LED light bulbs. The result is deceptively simple pieces representing an intriguing marriage of modern and rustic, nature and technology. In addition to it's basic stick pendants, Stickbulb offers more complex pieces that play with the company's light-structure concept. The Chime Chandelier evokes the familiar shape of wind chimes, bringing a bit of the outdoors in. As with most Stickbulb products the warm, natural hue of the wood is a welcome addition in nearly any decorating scheme. In a departure from their penchant for reclaimed wood, Stickbulb offers the X Collection. Made of metal, the polygonal shapes push the concept of lighting even further as the lighted structures can be customized for use as tables or shelving as well as overhead pendants or chandeliers for the ultimate in ultra-modern concept lighting. Another designer taking the concept of light and structure to new artistic heights, the Brooklyn-based Bec Brittain draws on her experience in product design, architecture and philosophy to create amazing light fixtures. Here her Echo Chandelier uses light rods directed inward to bounce light off of a series of mirrors extending outward to diffuse light around a room. A more conventional but by no means less creative approach, the Twin Vise Pendant (also available in singles) uses geometric metalwork in brass to add pattern to a room and draw attention to the lighting. Entwined within the brass, twin shades of double fade glass fit perfectly within the metallic "claws." Designed to emit a soft glow when lit, the glass is specially colored to reflect the colors of the sunset at the beach for which the color combinations are named. The Maxhedron design showcases the range of Britain's talent while taking her light and mirrors concept to it's fullest extent. As the name suggests, the tessellated form of the pendant uses geometric shapes etched into the glass to add yet another stylistic level for a show-stopping effect.